When I created this veggie garden - this whole area was grass. The flower beds weren't there, either. I marked off a space of about 25 ft by 35ish ft. Tilled it and shaped it into the fenced in area. After about 5 years, the wood boxes deteriorate. 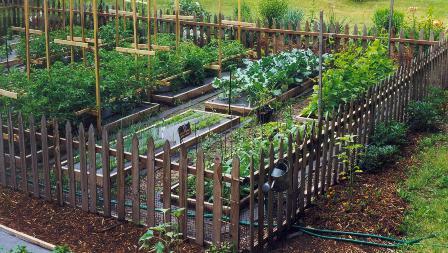 I used untreated wood - because these gardens are "food". 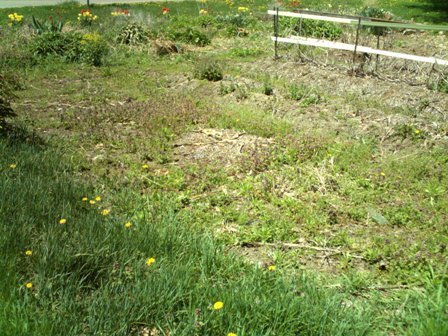 Treated wood can leach the chemicals into the soil... and therefore are not recommended for vegetable gardens. I have considered new ideas - plastic wood or concrete blocks - but in the end, rows are the easiest to work with, in larger scale like this garden. 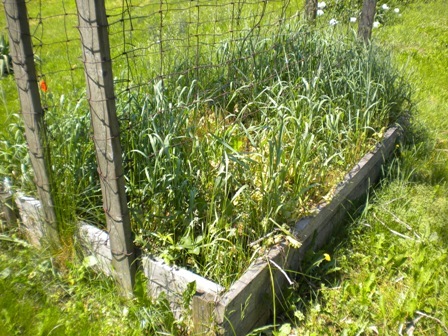 What the garden looks like after the winter. Like all gardeners - the winter is about dreaming what we will do for the next summer. 2010 is a year to revamp the rows; having not been fully tilled for about 6 years. 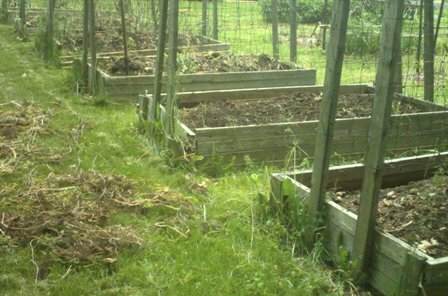 Each year I turn the soil using a fork, in March & April, add compost, rake out, and wait to plant in May. This year, it was time for a refresh. The boxes were deteriorating badly and it was time to "expand". The best way to refresh is to bring in the heavy equipment. This tiller was my single most important purchase... once I went to a larger garden. 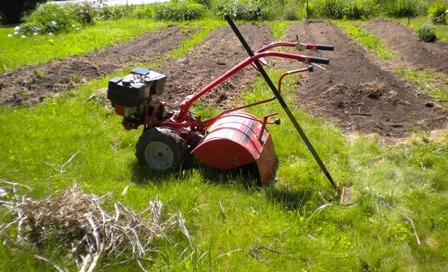 This tiller is also used to break ground for new flower beds. TIP: if you're in the market for a tiller (of any size) - only get a rear-tine model. Front drive tillers are like riding a bucking bronco... do yourself a favor and don't go there! I rented a front-tine model when I put my first garden in (10ft x 15ft) and it took me about 8 hours to do what I can do in less than an hour with this one. Take apart what's left of the boxes, till and move soil around. This box is very active in the spring. But it cleans easily. How much time does it take to clean up after the winter? 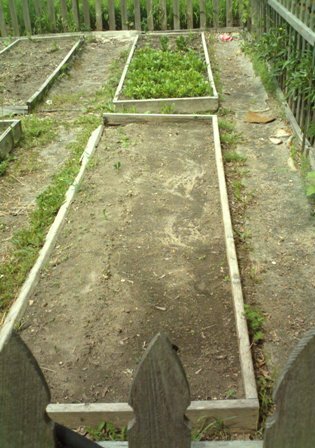 I plan for 2 weekends and usually spend about 5-6 hours each day... so about 20 or so hours to fully prep the beds for planting. This is about the same time I spent to till, restructure, and prep for this year. There is still more time required to reinstall the supports, but I can usually delay those for at least 1 or 2 weeks. Weeding? Sure it's necessary and I've tried a lot of methods. The black rolls of material - never stopped a weed in it's life. They just grow under it (and later on it) and push the material up until it is useless. Black plastic is probably the best way, as it shades completely - but that's expensive and it also blocks rain - so you have to handle watering using other methods. I've moved to just running a "sliding hoe" through the beds weekly, until enough shading occurs as the plants grow, then every couple of weeks. 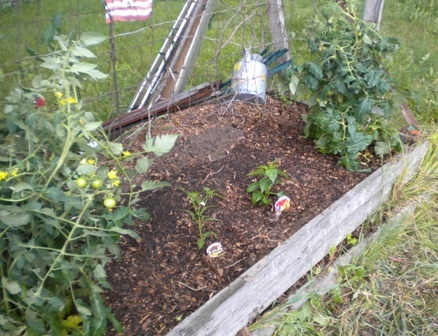 In July, after the ground is fully warmed (tomatoes/peppers like hot soil) I cover with mulch to keep the soil moist. The mulch & shading, each reduce the need for weeding as the summer progresses. Time to start putting in the 'maters. This row has 57 tomato plants and about 12 lettuce interspersed. 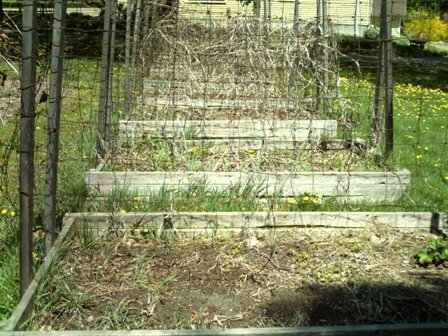 The lettuce grows quickly and when the summer sun gets really hot - the tomatoes will help shade the lettuce - for an extra week or two, before a 2nd planting of lettuce, in late August. "Dibble" made out of a paint roller handle. I could run string line to mark off "squares" - but at this scale, that would not only take a lot of time, it would cost $$ for string and stakes. 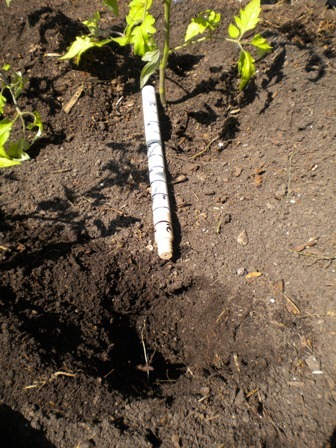 A long time ago, I read in one of my many garden books, about "dibbles"... essentially a stick to poke a hole in the ground to drop a transplant into. For the veggies that come in 48 or greater flats, this dibble works just fine. Note the 1 inch markings - to make measuring quick & easy. If I plant any transplants that come in flats of 18 (3 inch cups), I use a standard trowel to pull soil back and drop it in. 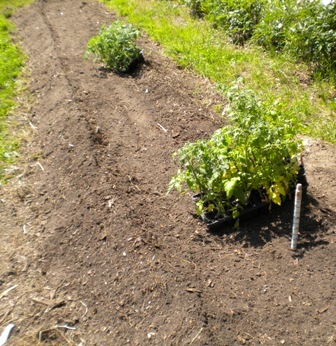 One row planted: 57 tomatoes here. Most of the rows planted. This box will not be fully planted. It is shaded by a tree now, until Noon and then again about 7pm. Most veggies need a fairly consistent 8 hours of sunlight, the more the better. So the back side of this box is no longer viable - without performing some tree surgery... which we don't want to do at this point. The loss of those few square feet are not critical, with the added length of the rows now... The box will probably be removed next year and the flower planting bed extended into this area. This box will get one more year of use. 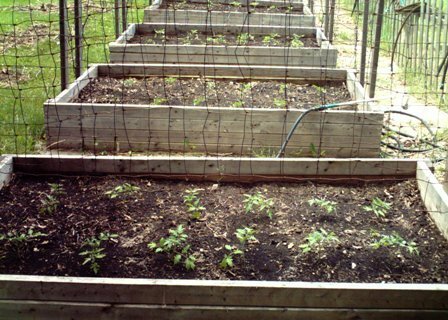 Next year I plan to make this the "fifth" row - making 5 rows @ 3 ft X 32 ft. There we go... always future planning. You will note that I've gone fully away from manicured paths around the beds, to just letting grass grow there. I tried wood mulch, black weed barrier with mulch, and other "stuff"... none of which helped and just made it harder to clean up in the spring. Grass, as a ground cover, works just fine. I mow (with mulching mower) so any trimmings (weeds, etc) are just dropped there to be mowed in. Grass is easy on the feet and "low cost"... it comes back all by itself! Spaghetti squash - highly recommended! Cost for transplants? Less than $100 (where I live). The harvest - while unknown & unpredictable, my past gardens have resulted in about 400 pounds of tomatoes (canned (e.g. mason jars) or frozen (e.g. Ziploc freezer bags) for later use), at least 50 pounds of bell peppers, and various other items. When you consider that a pound of tomatoes at the store is at least $1 to $2 and bell peppers can be easily $1 to $2 a piece... you can see why I do this. The bonus? Sure... besides the cost savings, there is more! As someone whose work is primarily behind a keyboard & monitor... the garden gets me outside for some exercise that doesn't cost extra (e.g. a gym membership) AND the veggies don't contain "extras" like you find in store bought. Have Fun in the Garden...whatever the size!